August 22nd, 2017 | Moving Tips, Packing Tips. Unless you have an unlimited eat-out budget, you still have to cook while you’re in the midst of planning and packing for your move. To keep yourself organized, think of how to move your kitchen in terms of the past, present, and future. Dry goods that you’ve bought in the past are generally okay to take on a move, but be aware of some problems that may result. If flour or grain products have any unseen insect eggs in them, those bugs ride to the new house. It’s better to buy fresh flour and cereal in your new place to avoid past pest problems. Canned goods should be checked for expiration dates to ensure freshness. Pack cans in smaller boxes to avoid creating overly heavy moving containers. Cans may burst when exposed to extremely high or low temperatures. Carry these items in your personal vehicle if your moving van will be traveling through an area with extreme climate conditions. Long-distance moves are not suitable for frozen foods. Start cooking up your frozen foods a month or so before your move, and the food won’t go to waste. Alternatively, offer food to family members and neighbors who will appreciate the extra bounty. When you have to pack up your kitchen while still preparing nourishing meals, making school lunches, or caring for an older family member, take a moment to get organized so you don’t feel overwhelmed. Have a moving notebook, meal planning app, or computer file where you make a list of all of the meals you need to make between now and your move. Next, use the number of meals to create a list of all of the ingredients you expect to use up until moving day. This list helps you determine which food items you’ll be using up during the move and which you can safely pack up now. Be proactive and pack any dry goods and non-perishable foods you intend to take to your new home, then store them in a cool, dry place away from the kitchen. The extra space you create lets you deep-clean areas while you’re still using the kitchen. Pack appliances, cookware, flatware, and tableware you won’t use before moving to free up even more drawer and cabinet space for cleanup. This pre-move purge helps you see that you’re making progress even though you’re using your kitchen as usual. It’s very easy to pack your kitchen to make life easier for yourself in the future location. All it takes is a little time and commitment. Start as soon as you know you’ll be moving, and you’ll be amazed at how organized things are once you’re in your new place. As you pack up each item in your old kitchen, imagine yourself opening the box and putting the item away. Where will the item go in your new home? Is there room for this item? Pare down your kitchen belongings before you move into a space with a smaller kitchen. Then, you won’t have to make any difficult decisions in the future kitchen. Remember that during a move, boxes may be stacked on top of one another so you’re unable to see the writing telling you what some boxes contain. In the future, you’ll have to dig around and perhaps move a lot of boxes before you find the exact items you need in your new kitchen. Avoid this dilemma by writing the contents in big letters on all sides of boxes. Pack small kitchen tools in covered totes or boxes, but make a master list of items in each box. First, take your kitchen notebook, computer spreadsheet, or your phone and make a page where you name each box of smaller items. Call it the “utensil box” or the “kitchen drawer box.” Then, list the items in order. Mark all sides of the Pizza Night Box with its name, hang on to your list, and you’ll know exactly where to find the cheese grater for your first salad in your new kitchen. At the very least, take a picture of the box before you close it to help you identify specific boxes and contents. 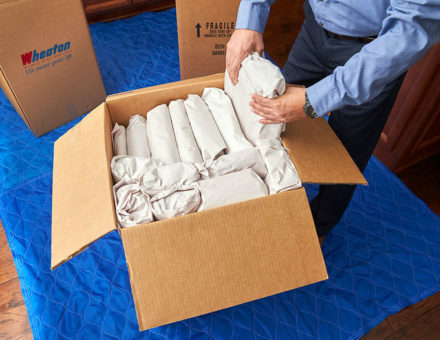 Wheaton World Wide Moving has more tips and products to help you move your kitchen, including specialty boxes and appliance-moving experts. Contact us today to arrange for your future whole-house move across the country or across the globe.